The national tour of the new musical THE ADDAMS FAMILY, based on the bizarre and beloved family of characters created by legendary cartoonist Charles Addams, will make its Traingle premiere February 28-March 4 at DPAC, Durham Performing Arts Center as part of the SunTrust Broadway at DPAC, 2011-2012 Season. Chris Jones of the Chicago Tribune described the production as “classic, full-tilt, fast paced, old-fashioned musical comedy! THE ADDAMS FAMILY features a book by Marshall Brickman and Rick Elice, and music and lyrics by Andrew Lippa. The production is directed and designed (sets and costumes) by Phelim McDermott and Julian Crouch, with production supervision by Jerry Zaks and choreography by Sergio Trujillo. The production features lighting design by Natasha Katz, sound design by Acme Sound Partners and puppetry by Basil Twist. THE ADDAMS FAMILY tour is produced by Stuart Oken, Roy Furman, Michael Leavitt, Five Cent Productions, Stuart Ditsky/AdamDitsky, Stephen and Mary Jo Schuler, Eva Price, James L. Nederlander, Stephanie P. McClelland, Pittsburgh CLO/Gutterman/Deitch, Vivek Tiwary/Jamie deRoy/Carl Mollenberg and Mary Lu Roffe, by special arrangement with Elephant Eye Theatrical. International productions have been announced for Brazil (March, 2012) and Australia (March, 2013) with others to be announced shortly. 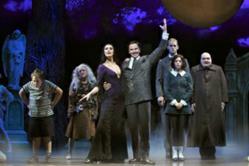 For more information, visit http://www.theaddamsfamilymusicaltour.com.